Goizueta Business School professor Erika Hall made national headlines for her research on biases related to the terms "black" and "African American." 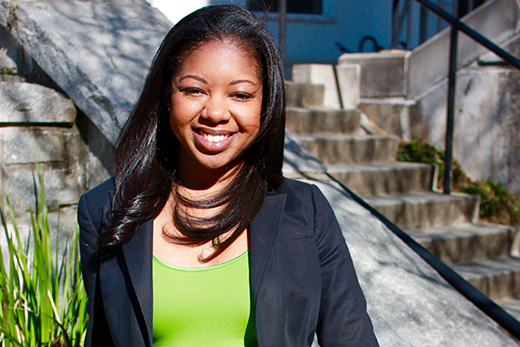 Her new work focuses on the role of race in law enforcement. Erika Hall, assistant professor of organization and management at Goizueta Business School, is making headlines. Beyond the attention to her academic research, she was recently named to the Atlanta Business Chronicle's "30 Under 30" list. Some inequalities are implicit in racial titles. In a 2015 paper published in the Journal of Experimental Social Psychology, Hall suggests the terms "black" and "African American" take on different meanings in different settings. White Americans, her research indicates, view the word "black" as having more negative connotations than "African American." Hall and her fellow researchers found employees identified as "black," while equal to "African American" counterparts were deemed to be of lower socioeconomic status and assumed to have less education. Hall and her colleagues also found distinct biases in the media when the term "black" was used to describe those of African descent. Hall told NPR's Bob Garfield that news articles using "black," in general, had a more negative emotional tone. Hall knows, however, that racial bias isn't limited to titles. Her most recent work focuses on how race — and the many biases associated with skin color — plays a role in law enforcement and the judicial system. Her new paper, "Black and Blue: Exploring Racial Bias and Law Enforcement in the Killings of Unarmed Black Male Civilians," is scheduled to be published in American Psychologist this month. Hall spoke with Emory Report about her latest research and the impact of her work. What's the difference between your new paper and previous work? It's actually a review paper, so it reviews literature in social psychology and industrial and organizational psychology on racial bias and law enforcement. The paper reviews several studies that look at how certain law enforcement strategies may cultivate bias. The other side of the paper talks about how, even though there are these mechanisms within police organizations, the bias itself is rooted in the people, not the police. So it says everybody's biased, but then there might be some additional mechanisms within the police that might exacerbate these biases. But we can change those, right, because those are organizational things. The real problem — the root cause — is these biases in the general population from which police officers stem. Has your work had any tangible effect on law enforcement or in changing the judicial system? My highest professional achievement was a letter from an inmate at a correctional facility in New York. The inmate wrote that he didn't have access to the Internet to search academic papers in prison, but that he was extremely interested in reading my research and learning about its implications. I cite this as my highest achievement because I truly felt that my impact extended past the ivory tower to the underserved communities that it could help most. The article that he mentioned focused on biases in the criminal justice system. Thus, the work could be significant for a defendant's rightful vindication in the justice system. How do you hope that inmate – and other people – can use your work to affect change? The paper the inmate was asking for was the paper about "African American" versus "black." In my opinion, language would greatly factor into somebody's court case, because when in court, the words that you use and the terminology that you use often affect how the jury perceives the case. So, that's how my work can have that tangible effect. But there's also a study in that paper of news blasts you get if there's a crime on campus. We did a study and sent different reports, saying a black suspect was seen running on Lake Street and had stolen this, or an African American suspect was seen doing the same thing, and people actually felt warmer to the African American suspect, which suggests that the little change of the label has implications.